Perhaps as my hair gets thinner my need for warm hats grows. I love pompom tops! 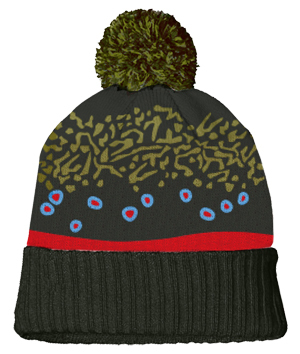 Now you can enjoy trout skin style on a traditional winter knit cap with prominent pompom top. A head-warming rib-knit spun from 100% acrylic yarn. 10% of the proceeds from this product supports our conservation partners.